As Russian and American theoretical crystallographer, chemist, physicist, and materials scientist Oganov is known mostly for his works on computational materials discovery and crystal structure prediction. He graduated with MD diploma from Moscow State University, obtained a PhD degree from University College London, and got a Habilitation degree from ETH Zurich. 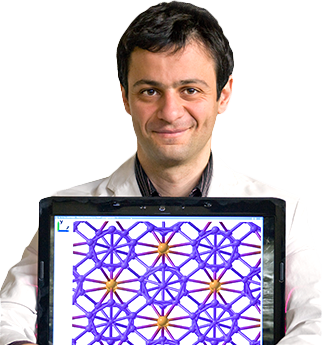 Oganov is Professor and director of the Center for Materials by Design at the Stony Brook University and Professor at the Skolkovo Institute of Science and Technology. Oganov has published over 160 peer-reviewed articles and book chapters. He is an author of 5 patents. He is a laureate of several prestigious awards, including an ETH Latsis Prize, Research Excellence Model of the European Mineralogical Union, three most-cited paper awards from Elsevier. In 2001, Forbes ranked Oganov among 10 most successful Russian scientists. In 2012, Oganov became a Professor Honoris Causa of Yanshan University (China), in 2013 elected Fellow of the Mineralogical Association of America, in 2015 elected Professor of the Russian Academy of Sciences. In 2013, magazines "Russian reporter" and "Expert" have listed Oganov among 100 most influential Russians today. His most significant works are in fields of computational materials discovery, in particular the effects of pressure on chemical bonding, and state of matter at extreme conditions (e.g. inside the Earth and other planets). He has developed novel methods of crystal structure prediction that became basis of the USPEX code, used by >2900 researchers worldwide. Computational methods developed by Oganov open up the way to discovery of materials with desired properties. The Discovery of "Forbidden Chemistry"